Improving listening skills can be fun and interesting. What? You don’t believe me? Thankfully I have a different approach to making your listening skills better. Review that approach now by clicking this link and then come back to this page once you are done. I’ll wait here. 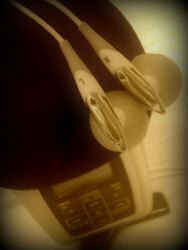 Welcome to a new way of improving your listening skills! I am happy to tell you that learning English or improving listening skills does not have to be boring or dull. 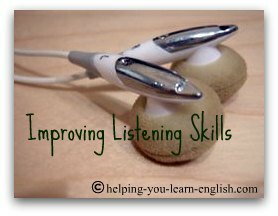 Choose from one of the links below to start improving your listening skills right now! The categories below are a combination of listening, reading, exploration and understanding practice. Here, the point or purpose is to use your English, not study it. Learn more about how traditional ESL listening programs might not be helping you as much as you think. - Vocabulary Activities Glossary: An audio glossary for each article. Do not worry! No one does. I was just reading a book, a very popular book actually, "New Moon" by Stephanie Meyer. I was looking at the prologue this morning and I saw a word that I didn't know. *GASP*...Diana doesn't know what a word means?!? She is an English Teacher!...a native speaker!! I don't know what every word in the English language means. Do you know what, "inexorably" means? I sure didn't. From the context I knew that something was doing something in an inexorable way...but what? 1. Unyielding; unalterable: inexorable truth; inexorable justice. 2. Not to be persuaded, moved, or affected by prayers: an inexorable creditor.